Century Wintersun, A seamless amalgamation of luxury, comfort and style blend to provide a truly sophisticated lifestyle. These Residential Villas in Bangalore are beautifully planned keeping in mind the architecture which can soothe your senses whenever you step into your house after a tiring day from work. Century Wintersun by Century Real Estate in Doddaballapur Road strives for customer satisfaction and believes in building world-class projects without compromising on quality standards, innovation and timely delivery. With well-ventilated apartments and uncluttered nature space, Century Wintersun makes you feel that every day is an excursion. Century Wintersun is one of the best investments in Residential properties in Doddaballapur Road, Bangalore. The Villas in Century Wintersun are strategically constructed keeping in mind excellent connectivity of public transport. Century Wintersun presents 3 BHK and 4 BHK Villas in Bangalore. 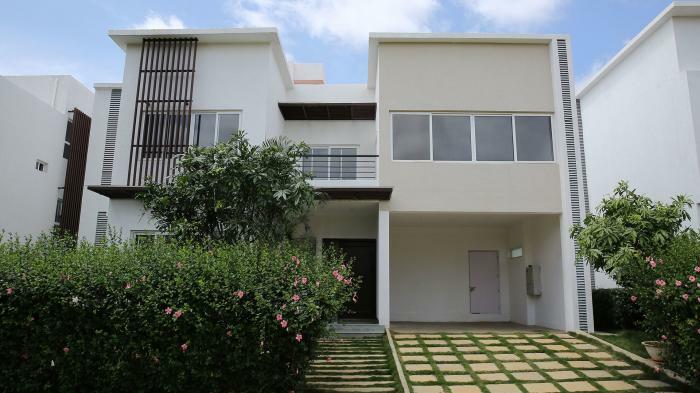 The price of Villas at Doddaballapur Road in Century Wintersun is well suited for the ones looking to invest in property at Bangalore. Amenities: Century Wintersun has been designed such that it includes all the world-class amenities such as Landscaped Garden, Indoor Games, Swimming Pool, Gymnasium, Play Area, Club House, Health Facilities, Tennis Court, Badminton Court, Car Parking, Jogging Track, 24Hr Backup Electricity, Basket Ball Court, Jacuzzi Steam Sauna, Squash Court, Party Area, ATM, Security, Kids Pool and Amphitheater. Location Advantage: Century Wintersun is conveniently located at Doddaballapur Road to provide unmatched connectivity from all the important landmarks and places of everyday utility such as hospitals,schools,supermarts, parks,recreational centers etc. Century Real Estate, with its headquarters in Bangalore, India was founded by Dr. P.Dayananda Pai and Mr.P.Satish Pai in the year 1973 with the primary objective of transacting in the simple buying and selling of land. More than 35 years later, the Company has evolved into an integrated, full service real estate development company that has transformed Bangalores urban landscape and is credited with several of Bangalores landmark developments such as Manipal Centre, Taj Residency, Vijaya Bank Head Quarters and Diamond District to mention only a few. Century Real Estate has the unique distinction of having purchased land on M.G.Road at INR 5 per square feet way back in 1973 where today the quoted prices are in the range of INR 20,000 per square feet. Regarded as one of the oldest and most respected companies in the Real Estate space in India, the growth of Century Real Estate has practically mirrored the growth of Bangalore as one of Asias fastest growing cities. Today, we are the largest owners of real estate in Bangalore with a land bank in excess of 3000 acres representing more than USD 2 billion in asset value and a development portfolio of over 10 million square feet comprising hotels, office buildings, residences, educational institutions and integrated townships spread across South India. CENTURY REAL ESTATE HOLDINGS PVT LTD is an EXCELLENT builder. It has 19 on-going projects with total inventory value of Rs.24660 Cr and 9 completed Projects. Review of Century Wintersun, Doddaballapur? Its price, location, builder etc. Review of Century Real Estate Holdings Pvt Ltd, Doddaballapur? construction quality, trustworthy, delivery history etc.? Review of Century Wintersun, Doddaballapur location? neighbourhood, connectivity, schools etc.? Comparison of Century Wintersun, Doddaballapur to nearby projects? Is it rightly priced? What is your feedback on this Century Wintersun, Doddaballapur? Depends on brand name and complete the project in time etc? Will this be a better option for investment or to live in Century Wintersun, Doddaballapur? Can you give some suggestion? Is the Century Wintersun, Doddaballapur has more potential in terms of capital appreciation, ROI, Rentals, Proximity to social infrastructure etc?